Woven Arts’ philosophy is to provide a unique selection of high-quality, fashion-forward artisan rugs, while adhering to the highest standards of social and environmental responsibility. Woven Arts is Minnesota’s preferred dealer for decorative, hand-woven, contemporary, modern and traditional area rugs. Our exquisite showroom displays the Woven Arts’ popular private label and highend brand name rugs. Additionally, Woven Arts offers a customization program, which empowers designers and clients to create their own original works of art. Established in 1998, the company has been servicing Minneapolis and St. Paul’s top architectural and interior design firms since inception. 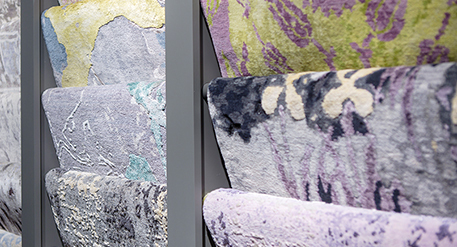 Located conveniently in International Market Square, our 6,500 square foot showroom is home to the largest inventory of rugs in the Minneapolis Design Center.